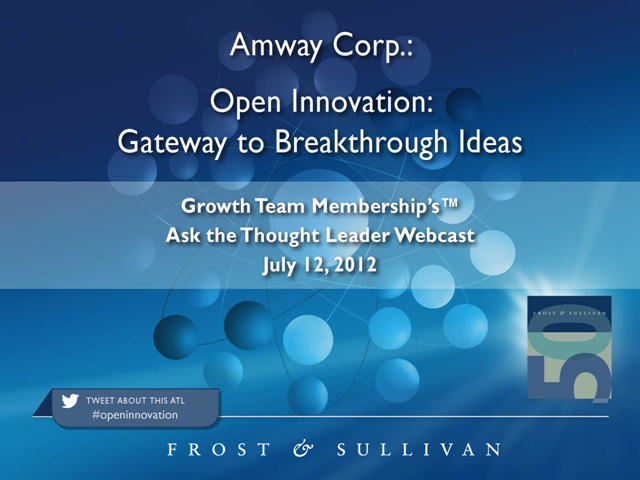 On Thursday, July 12th, 2012, the Growth Team Membership™ (GTM) will present a case-based best practice on how the R&D function at Amway establishes an Open Innovation (OI) team to draw on ideas and technologies outside of the company and increase its capacity for systematically identifying and developing breakthrough innovations. Featured Thought Leader: David Groh, Manager of Health and Beauty New Technologies R&D, will share key lessons learned and participate in a Q&A session. Profiled Company: Amway Corp. is headquartered in Ada, Michigan, and is a consumer goods company.